Setting up an aquarium can be a very expensive process however if spending slightly more money setting it up will largely benefit you in the long run it’s worth exploring all options. I have chosen to write this article outlining the pros and cons of the best canister filter on the market, providing information about the benefits they can offer and what sizes you might need. It is essential for any aquarium enthusiast to explore all options when setting up their aquariums and a canister filter is a very strong candidate for most set-ups. Why Should You Choose A Canister Filter? Canister filters are mostly used in large aquariums performing a purifying treatment to the water in the tank. Including a proficient filter is a key factor to any large aquarium as the filter executes many vital tasks that are a necessity in maintaining a healthy aquarium. A canister filter provides a balanced, consistent flow of water and the filtration system is capable of eliminating any harmful toxins. The canister filters also provide an excellent oxygen balance to the tank ensuring all living beings inside a healthy life. These filters are available in many shapes and sizes, all of which will depend on the size of your aquarium. Further on in this article I talk about what sizes are best used in which tanks but for now, I want to explain fully how a canister filter actually works. Canister filters are usually situated underneath, behind or beside the tank tucked away out of sight, the filter is connected to the aquarium by tubes. The first tube is used for drawing the water out of the aquarium and the second tube is used for restoring the water into the aquarium. The water that is drained from the tank via the suction tube gets directed to a filtration system where the water gets purified and toxins and wastes are removed. Once the water is cleansed it gets pumped through the second tube and reinstated into the aquarium. This process is constant, the water continuously goes through this cycle enabling the aquarium to stay clean. One of the fundamental advantages connected with a canister filter is that you are able to add extension filters to it depending on what you are housing in your aquarium. Should you need to, you could add a water heater to the filter or a carbon dioxide diffuser for example. With a canister filter, you allow multiple options granting you the ability to have a proficient set-up for anything you choose to accommodate in your tank. Another superior quality of the canister filter is that it will allow a continuous population of beneficial bacteria to remain in the tank preventing any pollution. Every aquarium needs to have a beneficial bacteria population because without this bacteria, a high toxic pollution will accumulate and spread throughout the tank killing everything in it. Beneficial bacteria is formed through multiple sources of your aquariums contents and their growth is reliant on food. Since there are instruments available for you to measure the different levels of ammonia and nitrites, you will be able to establish the size of the beneficial bacterial society that resides in your tank. The beneficial bacteria take action by converting toxic biological waste that fish produce, it does this by gradually breaking it down multiple times, each step resulting in a less toxic outcome. Without this process, any kind of filter that is installed would struggle to keep the pollution levels down and would leave the life of the aquarium at a high-risk of being harmed. Large aquariums benefit from canister filters more because of the significant volume of water they can process at one time. This enables adequate cleansing on a suitable basis. Below I have written about the highest recommended canister filters for different sized tanks that will hopefully give you a clear understanding of what you need to look for when purchasing a canister filter. 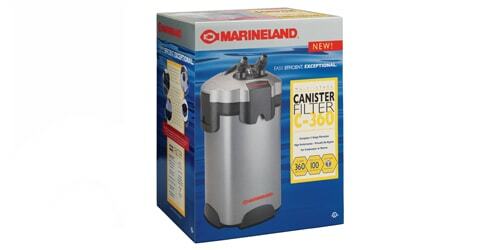 The canister filter you choose will ultimately depend on your aquarium. Canister filters are very valuable in the fact that they can filter large amounts of water promptly which is ideal for maintaining a healthy aquarium. 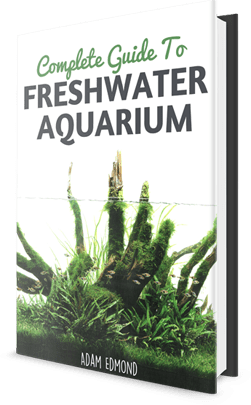 The size of your aquarium will be one of the key factors in choosing your filter, that being said the type of fish you plan on adding into your aquarium will also play a role in choosing your filter as some fish tend to be messier than others. If for example, you’re setting up a 200-gallon aquarium its best to go with a filter that’s suitable for a 250-gallon aquarium, for peace of mind that the filter will be able to cope with maintaining your aquarium effectively. As the saying goes, it’s better to go for more than less. You will also want to take into consideration the shape of your aquarium as different canister filters have different set-up specifications. Fundamentally you will want the filtered water to be able to cover as much area of the tank as possible. One thing you should think about is that, if you’re prepping a 300+ gallon aquarium you will probably find that you will need to have more than one filter. As powerful as canister filters are there is only so much they are capable of when working alone, the power of two will generate double results and evidently produce that hygienic, healthy environment that your aquatic life need. Larger aquariums tend to house noisy filtration systems due to the constant large amounts of water that it processes. 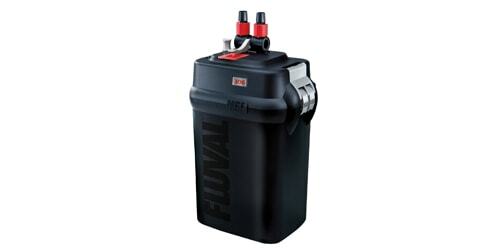 The Fluval FX6 canister filter has been built with detailed engineering which has successfully reduced impeller vibrations resulting in a quieter system. This is the largest capacity canister filter in this range with a filter circulation of 563 GPH and a pump output of 925 gallons. The output nozzle on this model is capable of generating a distinct water flow that can reach all the critical areas of the tank. To maintain an efficient filtration system, these filters need to be regularly cleaned. This specific model includes a dial to remind you when the next maintenance schedule is due. The aqua stop valves enable simple maintenance – you can cease the flow of water with one turn and disconnect the hose from the filter allowing easy access. The Fluval FX6 canister filter has a fitted intake strainer for high performance as the strainer is shaped specifically to channel the water promptly and prevent any build-ups that could potentially block the filtration system. This well designed strainer includes a fine screen which is capable of forcing back any debris that could obstruct the water flow. Holding a rating of 4.7 out of 5, this highly recommended canister filter has very strong reputation. Reviews show very little flaws other than a couple potential manufacturing errors. One or two mention the fact that the material isn’t as strong as it should be whilst others rave about the quality of the filter. I have come across a few reviews that mention the instructions aren’t very clear but luckily with the wonders of the internet you can find multiple directions to help you. Suitable for both fresh and saltwater aquariums this canister filter has a flow rate of 550 gallons per hour and is desirably energy efficient. Formed with a 4-stage filtration system this model has been designed to perform a thorough water purification. The first stage of the 4-stage filtration setup concentrates on biological and mechanical filtration, whilst the second stage executes a more in-depth biological filtration. The third stage focuses primarily on a chemical filtration and the fourth stage enables an extension of either biological or mechanical filtration depending on your aquariums specifications. This particular canister filter possesses a UV lamp, as part of the filtration cycle the water gets directed through a UVC clarifier before re-entering the aquarium to prevent any radiation. With a growing popularity, this canister filter has had many positive reviews, this model comes highly recommended and is available at a great price. Eheim is a very well-known brand in the aquarium industry with multiple products on the market this one is rated in the top 3 for large aquarium canister filters. One of the most appealing feature of this canister filter is the large priming cylinder that offers automatic self-priming. Multiple aquarium enthusiasts find the priming part of the set-up to be quite trying but with the automatic self-priming option that this filter provides, this is now a simple step. This filter has a pump output of 450 GPH and is ideal for marine and freshwater aquariums. The safety hose adapter on this filter has been designed so that it can only be disconnected when the hose taps are fully closed preventing any mishaps. Maintenance is key when it comes to keeping an efficiently running aquarium and it’s just as important in prolonging the life of your filter, which is why the flow rate indicator on this model has been engineered to inform you when it’s time to clean the filter. When you’re running a large aquarium the last thing you want is a loud filtration system, the high-quality ceramic components built into this machine ensures a quieter function. This canister filter also comes fully equipped with favorable filter media. Early reports show that this specific model suffered a manufacturing issue in regards to leaking within a few months of use but recent reports suggest that Eheim corrected the fault and provided customers with new fittings to keep their reputation in good health. Recent reviews have shown a significant improvement in the filter and the overall quality. 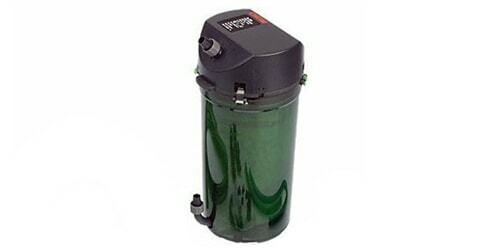 Considered one of the best canister filters on the market, the cascade 1000 has a pump output of 265 gallons per hour. It offers a precise mechanical, biological and chemical filtration and contains a floss pad that eliminates fine particulate matter. The triggered carbon media withdraws toxins from the water and assists purification. The added coarse sponge encourages the growth of beneficial bacteria which will significantly reduce the ammonia and nitrate levels resulting in a much healthier environment. The cascade 1000 is fitted with water-tight locking clamps and an integrated O-ring for added security. The quick-disconnect tubing connectors that are installed in this filter is also the point of control for the filters flow rate. The Penn Plax cascade currently holds a 4.3 out of 5 rating and has over 1000 reviews. Mostly, people are impressed with the overall power of this machine and have expressed how clear the water is because of it. Although it has been mentioned that it can take longer than most to prime, the design of this filter enables an easy maintenance. The cleaning of your filter can be one of those things that you know you have to do, but can’t really be bothered to, but at least with this filter you can disconnect easily and reassemble quickly making this process a lot more straightforward. 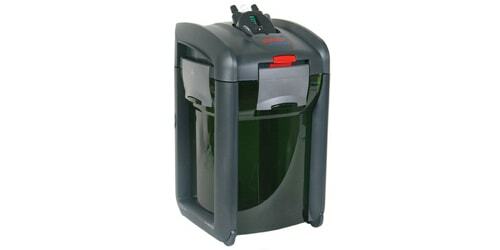 The Hydor canister filters are arguably the best looking filters on the market, the sleek black design resembles that of a computer monitor and looks very stylish compared to most filters. Although it’s one of the more expensive filters available it definitely offers all the essentials and more. 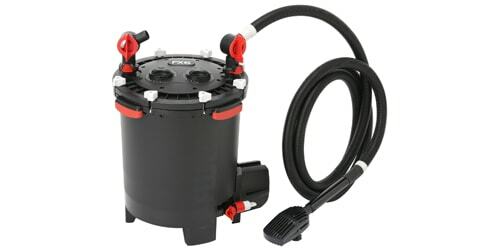 It has a filter circulation of 260GPH and a pump output of 320GPH that is suitable for aquariums up to 125 gallons. The unique feature of this canister filter is the option you have when reinstating the water. You have the choice of an expandable spray bar or an adjustable angle flow return. Spray bars are a great way to easily oxygenate the water which is extremely beneficial to the life inside your aquarium. The spray bar for this filter comes in 4 sections allowing you to control the length and customize it to your tank, a desirable trait for any canister filter. Hydor has a reputation of manufacturing high-quality, strong products and this filter is no exception. With a 4-lock clamping design and the use of integrated nuts for an anchored hose connection this filter definitely has the security you want. Its ceramic motor shaft will prolong the life of your filter and the rotating intake and outflow connectors authorize easy adjustment. Reviewers have noted that the noise level on this filter is almost non-existent and the high-quality materials used, makes for a very sturdy unit. With the Hydor professional canister filter being fairly new to the market it is certainly gaining popularity with a rating of 4.3 and over 100 reviews written on amazon alone. With the accumulating admiration of this filter, it wouldn’t be surprising if it lands the top spot in the near future. 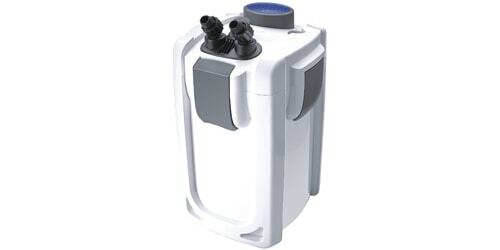 A built-in 9 watt UV sterilizer helps this filter control bacteria and algae and promotes clear water. Because beneficial bacteria clings to the filter media and the sand in your aquarium you won’t have to worry that the UV sterilizer will diminish the beneficial bacteria, it can still do its job whilst the beneficial bacteria continues to thrive. It has a pump output of 370 GPH and even produces great results when it needs cleaning. Including 3 media trays, this filter offers the option for a large capacity of extra media which provides additional beneficial qualities for your aquarium. The latching setup for connecting the head is very easy to fit together which is particularly good as the instruction manual that comes with this filter can be rather confusing. The majority of this filter is made from thick plastic that is able to withstand any bumps it might receive. It is crucial for an external canister filter to be made of strong materials since it sits on the outside of the tank. An added bonus for this filter is the well-designed self-priming pump that extinguishes the need for manual siphoning for extra convenience. 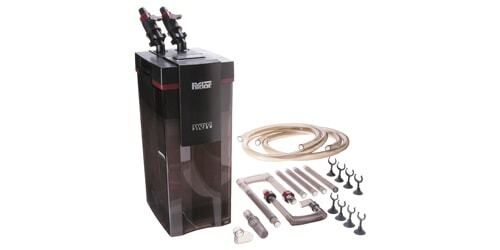 The extremely secure hose connections on this filter are practically leak proof and the quick release shutoff is able to close both the intake and outtake hoses with one switch. At a very affordable price, the filter itself is reported to run as efficiently as the expensive brands although over time you may want to upgrade some parts like the spray bar or intake tube. Retaining a rating of 4.2 reviewers are highly impressed with the quality and running of this filter especially as it comes at a very decent price. Suitable for aquariums up to 70 gallons this filter has a flow rate of 303GPH. The newly refined range contains more powerful motors that are more favourable for your aquarium. Because of the upgraded motor hydraulic performance, as well as increasing the head pressure and flow rates, maintenance is needed a lot less often. The multi-stage filtration system is separated into various sections and utilizes the entire canister for the utmost productivity. The design of the filtration system guides the water through a specific flow route to boost the contact with the filter media ensuring the media provides as much potential as possible. Complete with several removable filtration baskets that grants you complete customization when adding media into your aquarium. 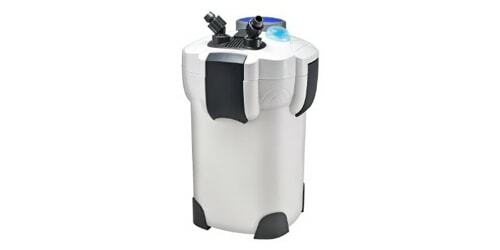 Biological filtration has been remarkably improved because of the incorporated bio-foam media along with additional chemical and mechanical media, this canister filter arrives with all the vital media you could want. Detailed redesign has created a stronger impeller cover minimizing the chance of damages, the impeller has also been manufactured to generate less noise equalling up to 15% less sound than before. 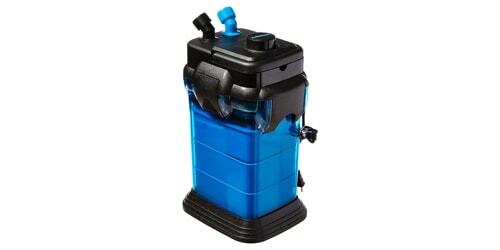 The filter has been designed for an easy no-nonsense setup and features a patent aqua stop valve which is able to cease water flow without disconnecting hoses, this will prohibit any leaks or mess. Fluval is a very well-liked aquatic brand and so it’s no surprise that yet another one of their models has reached the top spot. Although Fluval canister filters tend to be rather more costly than other canister filters on the market it seems you definitely get your money’s worth. Their particularly thorough designs are formulated to provide a filter that exceeds expectations and bring you supreme ease of use and maintenance. As we have seen before Eheim are renowned for manufacturing energy efficient filters and since they are one of the original producers of canister filters their models have been tried and tested by countless amounts of enthusiasts all over. With their wide audience and impressive ratings Eheim is one of the main go-to brands when choosing a canister filter. This particular version filters 116 GPH and states that it is suitable for aquariums up to 66 gallons. Unlike the majority of canister filters the Eheim classic filter is setup slightly different with the intake tube situated at the bottom and the outlet tube located at the top. Usually, both intake and outlet fittings are situated at the top of the filter which can sometimes mean that a small amount of water can re-enter the tank without completing the filtration cycle. By having the tubes fitted at either end of the filter all water is forced through each stage of filtration making it a very well organized system. High-quality materials are used for all parts of this filter and generally it is a very sturdy appliance with the ability for a lengthy life span. It comes with filter media, spray bar, canister chamber, filter sponge, hose and installation fittings, everything you need to start your setup immediately. Like most Eheim filters this one also comes highly recommended by many people who have been using this filter for several years. It has been documented that it’s maybe, not the best choice for an aquarium 60 gallons or over as it doesn’t quite have enough power to efficiently filter the aquarium as it states in the description. Other than that this filter has been proven to be a long lasting and reliable filter. The first launch of this canister filter indicated a manufacturing error due to numerous amounts of people experiencing leaks. Upon uncovering this malfunction Marineland called back every filter that had this defect (even ones whose warranty had expired) and replaced the affected parts and returned the filters to their owners promptly. Since then there has been little to none reported leaking which salvaged their reputation and has preserved them a spot in the top 3. The flow rate climbs up to 360GPH making it perfectly capable of filtering a 100-gallon aquarium on its own. It has a 3-stage filtration process consisting of mechanical, biological and chemical filtration. The media trays are sealed together using rubber gaskets which prevent even the slightest water bypass ensuring all water progresses through each stage producing clear, purified water. Canister filters can sometimes be extremely complicated to setup. Many filters are reported to have come with unclear, useless instructions but the manufacturers of this filter have provided a full DVD setup guide along with their instruction manual, making the setup of this filter easily understandable. Other than the minor setback at the original release for this canister filter, reviewers seem more than happy with their results and the general running of this filter. If you are not experienced with the maintenance of canister filters you may want to do your research for this one as over stacking the trays could cause problems when reassembling your filter. Although canister filters are the more expensive choice when it comes to filtering your aquarium they certainly offer great qualities and convenience. One thing to take into consideration is that canister filters do not last forever. As I mentioned before maintenance is hugely important to the smooth running of the filter and also the life of it, regular care and cleaning will extend the filters life. Like anything that is used continuously, over time it will suffer general wear and tear no matter how high-quality the materials are that it’s made from. This doesn’t necessarily mean you will need to spend all that money again purchasing a complete new canister filter as every make and model have replacement parts available at a relatively low cost. Is the tank in a location where I need it to be as quiet as possible? Do I want a spray bar for water return? How much space do I have for the filter? Is the fish in my aquarium considerably messier than others? All the models listed above are highly rated by countless amounts of people. They each offer their own unique features along with the basic requirements of any filter. Even though the listed filters are categorized in the top three that doesn’t mean that there aren’t other great canister filters out there, it just means that they aren’t as well-known as these ones. The absolute supreme filter simply comes down to your requirements and taste, my overall opinion is that you won’t go wrong with any of the filters listed above. They will all provide great results and widely benefit the beings living in your aquarium.